Despite dating back to the early 1600s, its facilities are firmly in the 21st century. They offer comfortable two-bedroom accommodation for up to four people. Dogs are also welcome by prior arrangement. Garaged parking is included in a nearby lock-up. 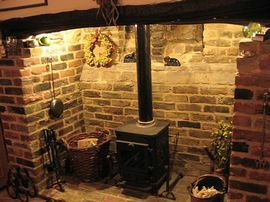 The cottage boasts a wealth of period features including an inglenook fireplace with working wood-burner, oak beams and pine panelling. It is compact, cosy and quirky with restricted headroom in some places. 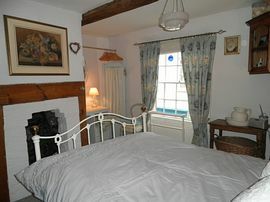 There is a double bedroom on the first floor and a twin bedroom in the second floor attic. The top flight of stairs is very steep, making the upper bedroom unsuitable for young children or old or infirm people. Sorry but we do not accept under-11's except babes in arms. Facilities include gas central heating, wi-fi broadband, fridge, oven and hob, microwave, two televisions, two DVD players, two radios, washing machine and tumble dryer. Furnishings are tasteful throughout with lots of personal touches from the owners. A secluded courtyard with table and chairs, provides a great place to sit outside on a sunny day. In winter the log-burner and chestnut roating pan make for a toasty evening indoors. 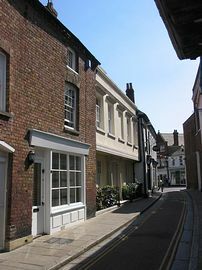 Sandwich is one of the ancient Cinque Ports which provided ships and men for the British navy in the Middle Ages. Among its many attractions are narrow streets with half-timbered houses, the river and quayside, historic gardens and an interesting variety of shops, restaurants, cafes and pubs. The nearby public library offers free Wi-fi access. 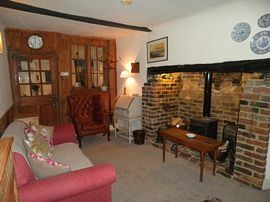 All these amenities are right on the Primrose Cottage doorstep. The mainline railway station is 8 minutes' walk. Boat trips may be taken from the quay: either upstream to Richborough Roman Fort or downstream to spot seals in the bay. Or you can stroll the Old Town Walls Walk to see the former moat and ramparts. Unspoiled Sandwich Bay is a must. 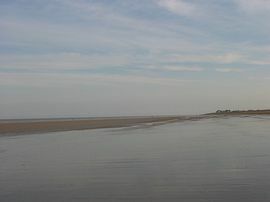 It is a few minutes drive or, alternatively, a picturesque 40-minute walk across the famous Royal St Georges golf course. Nature lovers may wish to visit the bird observatory, which welcomes guests. Ideally situated for a relaxing break, Sandwich is a dozen miles or less from several castles, the cathedral city of Canterbury, the white cliffs of Dover, Ramsgate Royal Harbour, the North Downs area of outstanding natural beauty and the seaside towns of Deal, Broadstairs and Margate. For a longer day out, London is accessible by regular train services or why not hop across the Channel to France or Belgium? Historic grade 2 listed building. Well-behaved dogs welcome with prior permission. Separate lock-up garage in a nearby street.Private courtyard with garden table and chairs. Local Services: Situated in town centre close to shops, banks, cafes, restaurants, pubs, library, station and bus stops. From London, North, Midlands and West: M2 towards Ramsgate and Canterbury, A2 to Canterbury, A257 from Canterbury to Sandwich. From Dover: A256 to Sandwich. By train: Sandwich Station is 8 minutes walk from the cottage. Low season: £300 to £360. Mid season: £390 to £430. High season: £460 to £520. Dogs: £20 supplement per booking (1 or 2 dogs). 30% of rental payable within 5 days of booking; balance 8 weeks before start of holiday. Standard rental: 3pm Saturday to 10am Saturday. Other durations and times are sometimes available. Please check with owner.